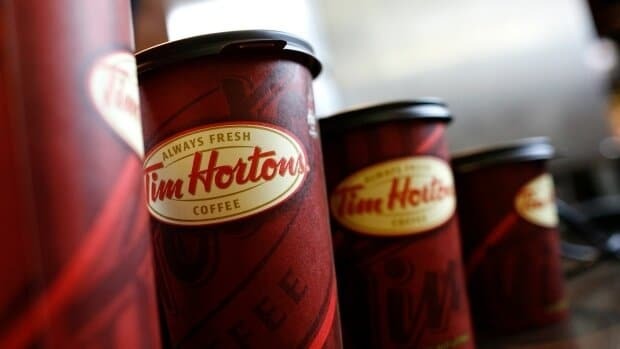 It looks like Tim Horton’s coffee is not the coffee of choice for Canadians. According to a recent Maclean’s poll, the coffee shop came in fourth place. It was McDonald’s coffee that actually came in first. More than 1500 people voted using Maclean’s Coffee Ranker. Each person who voted was asked to rank coffee chains on a list from most to least favourite. First place votes received 15 points, second place got 14, etc. McDonald’s came out on top with 19,494 points. Second Cup came in second place with 18,456 points. In third place was Starbucks with 18,100 points. Tim Hortons was in fourth with 16,260 points. And Van Houtte (served by A&W) rounded out the top five with 15,686 points. Canadians drink a lot of coffee. According to a 2016 survey by the Canadian Coffee Association of Canada, 67 per cent of Canadians over the age of 18 drank a coffee within the last day and 79 percent enjoyed one within the last week. 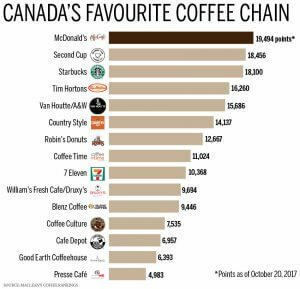 So with the number of Canadians drinking coffee, you would think that Tim Hortons, which some might say is an unofficial symbol of Canada, would come out on top. But with McDonald’s launching its McCafe line in Canada back in 2011 and after opening its first standalone store in 2015, this poll shows that it seems like the beverages have gained loyal consumers.